To catch and gracefully handle exceptions. 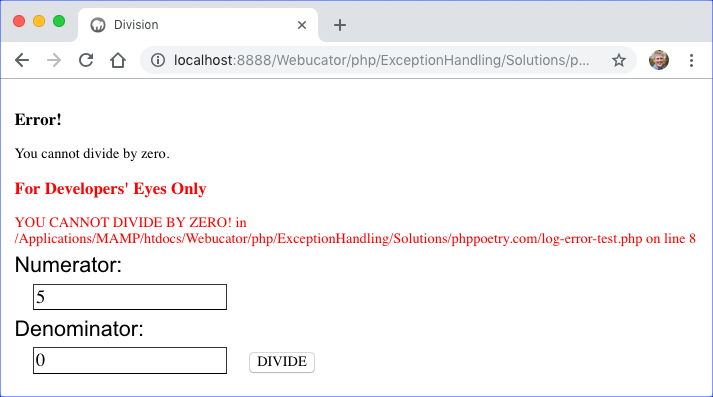 If an exception is thrown by PHP and there is no code in place to handle the exception, then PHP will log the exception in the php_error.log and, if the display_errors directive is on, send the error to the browser to display. If the error is fatal, no further code will be processed. 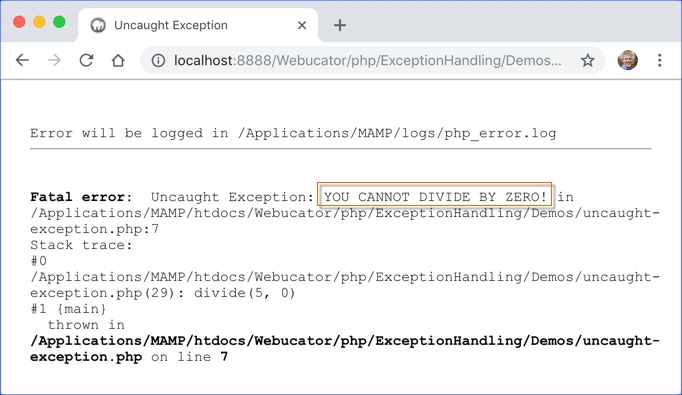 The following example shows how PHP handles division by zero, which generates a warning, the lowest level type of error. This does not stop execution of the code. Notice that the code continues to run after the error is output. INF (for infinity) is the result of division by zero. You may want to keep php_error.log open for the remainder of this lesson as we will be referring to it again. It is possible to throw your own exceptions using throw. While it's likely you won't have to do this unless you are creating PHP libraries that are used by other developers, it is worth seeing how it is done as you will certainly be catching exceptions thrown by libraries and PHP extensions that you use in your code. 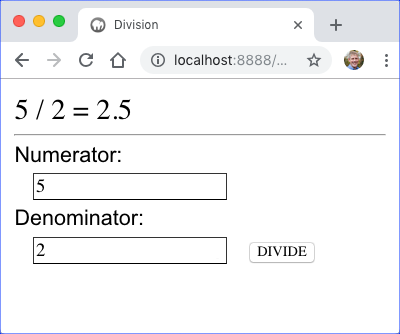 Notice that we cast $numerator and $denominator as integers. We do this in case someone passes in a string (e.g., '0'), which could be the case if they are getting the number from a form submitted by a user. Notice that the message we threw in our code is shown in the error report. The same error will be reported in php_error.log. Also notice that the code does not continue to run after the error is output. Exceptions that are thrown this way are fatal. To prevent them from stopping the program, you have to catch them. getMessage() - returns the exception's message. getFile() - returns the path to the file in which the exception occurred. getLine() - returns the line number on which the exception occurred. error_log( $errorMsg . ' in ' . $e->getFile() . Notice that the try / catch syntax is similar to the if / else syntax, but unlike if / else, in try / catch code, the catch block is required. error_log( $errorMsg . ' in ' . Notice that we check if $num and $den are numeric. If they are not, it is likely because the form hasn't been submitted and they are both empty strings, so we won't try to do any division. Open ExceptionHandling/Exercises/division.php in your editor. echo '<output>' . $num . ' / ' . $den . When working with external systems, like databases, email, the file system, etc., a lot can go wrong that is outside the PHP developer's control. For example, a database can go down, or the sign-in credentials can change, or table names can be changed. Because of these possibilities, you should write your code expecting things to go wrong, so your website doesn't just stop working without any explanation to the user. First, you will do an exercise in which you create a logError() function in utilities.php that handles how errors are logged. Second, you will do an exercise in which you create a dbConnect() function in utilities.php that connects to the database and returns the connection. If there is an error, this function will log the error and return false. Third, you will modify the site's PHP files to make use of this new dbConnect() function and you will add code to properly handle errors when preparing and executing queries. In this exercise, you will create a logError() function in utilities.php that handles how errors are logged. Open ExceptionHandling/Exercises/phppoetry.com/includes/utilities.php in your editor. void means the function does not return anything. mixed means that $e could be more than one type. The $redirect parameter is an optional boolean value, which defaults to false. Create a $msg variable to hold the error message to be logged. Use the gettype() function and an if - else block or a switch / case block to check the type of $e. If the type of $e is a string, then $e should be assigned to $msg. Otherwise, the function should assume the type is an Exception object and it should construct the error message from $e->getMessage(), $e->getFile(), and $e->getLine() and assign the result to $msg. Log $msg to the error log. This tells the browser not to show the page with the error, but to instead redirect to error-page.php. Visit http://localhost:8888/Webucator/php/ExceptionHandling/Exercises/phppoetry.com/log-error-test.php to test your code. 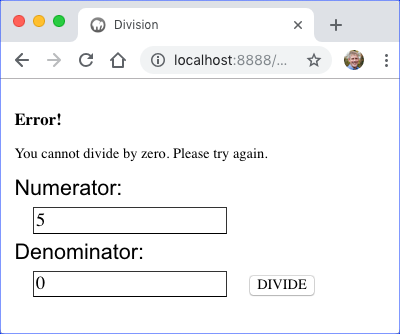 Enter any number for the numerator and 0 for the denominator and press the Divide button. You should see a result like this: If this doesn't work, fix your code and retest. If the page doesn't work at all, check php_error.log to see what went wrong. Be sure to change the isProduction() function back to returning false. $msg = $e->getMessage() . ' in ' . $e->getFile() . mixed means the function can return different types. Often, when a function can return different types, it returns the expected object if all goes well and returns false if something goes wrong. This is the case for the dbConnect() function you are about to create. Add a line at the top to include config.php, which we placed in the includes directory outside of the web root earlier in the course. That file contains a getDbConfig() function, which returns an array with keys for 'dsn', 'un', and 'pw'. Sets $dbConfig to what getDbConfig() returns. Attempts to create and return a database connection. On failure, it should return false after calling logError() and passing it the exception and true, meaning it should redirect to the error page when not in debug mode. Visit http://localhost:8888/Webucator/php/ExceptionHandling/Exercises/phppoetry.com/test-db-connect.php to test your code. You should get a "Success" message if the connection succeeds. We are intentionally trying a query that will break: there is no user_name field in the users table. If the query fails (and it will), $stmt->execute() will return false, so !$stmt->execute() will return true. This is not an exception in our PHP code. It is a database error; it is MySQL telling PHP that the query is bad. We log $stmt->errorInfo() to provide error information for the developer. It is also possible that something goes wrong with the communication between PHP and the database. For example, the database could go down between the time that we connected to it and the time we ran this query. In this case, a PDOException will occur. That's why we put the whole thing in a try/catch block. If no PDOException occurs and the query succeeds, the PDOStatement object will then have the data from the database and we can safely fetch it. In this exercise, you will change the code to use the dbConnect() function in utilities.php. You will also wrap all the code that prepares and executes SQL statements in error-catching code. Add code to includes/header.php to connect to the database and store the connection in $db unless $db has already been set. 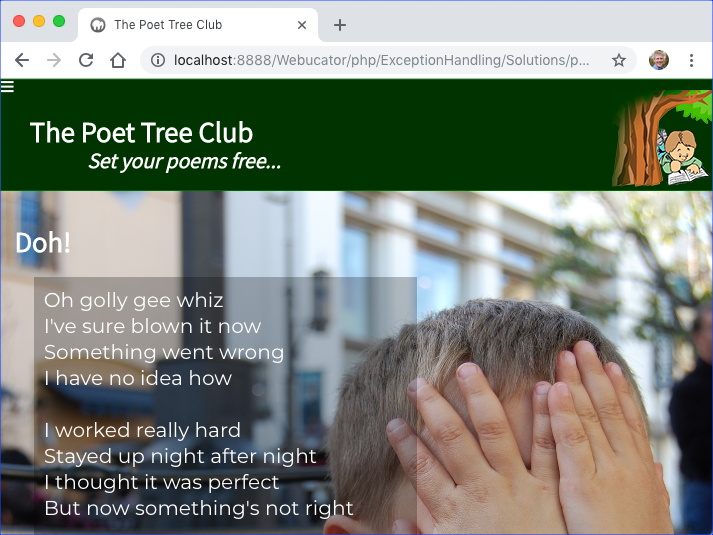 In poem.php, we need to connect to and query the database before including header.php, so that we can include the name of the poem in the title of the page. Set $db in poem.php. Note that this is why in header.php we only set $db if it hasn't already been set. Visit http://localhost:8888/Webucator/php/ExceptionHandling/Exercises/phppoetry.com/index.php and navigate around to test the site. If you get any errors, they should be reported to the browser in a way that helps you fix them.